The February 2nd British Empire & Foreign Countries auction at Grosvenor, opening the 2017 Season, achieved an excellent total result of £636,764. 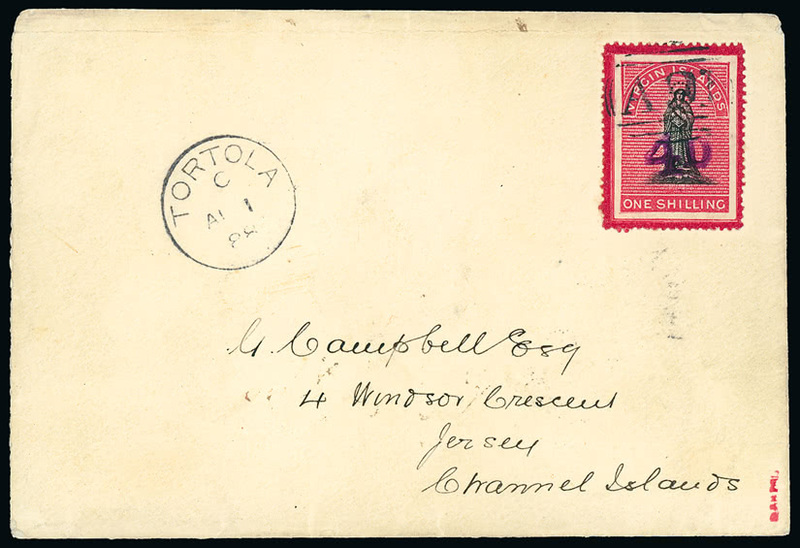 Many strong and unusual sections of lots featured throughout and were very well received, particularly those of Zeppelin Mail, Telegraphs, Cameroons, Togo and East Africa. 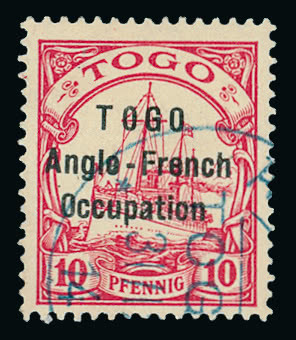 Star item amongst the Togo was the very scarce used example of the 1914 (Oct.) Narrow Setting 10pf. carmine with part “ANECHO” c.d.s. (S.G. H16, lot 1147, left) that rose to £2,380. 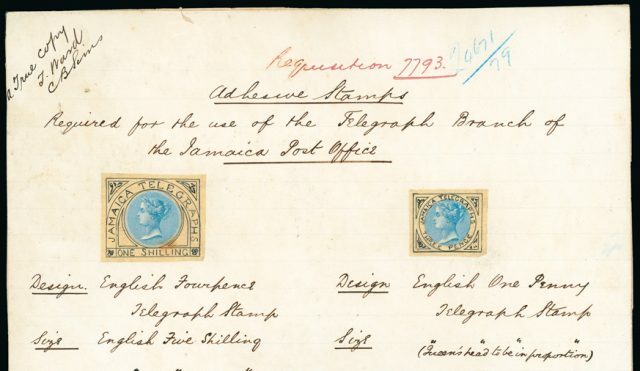 Amongst the fascinating Telegraphs, an archival page dating from 1879 headed “Adhesive Stamps/Required for the use of the Telegraph Branch of/the Jamaica Post Office”, and signed by Fred Sullivan, Postmaster for the Jamaica Post Office, bearing hand-drawn designs for the 1s. and 3s. with cut-out Queen’s head added (lot 330) achieved £3,094. Greatest enthusiasm was reserved for a series of highly desirable ‘old-time’ classic collections that drew a number of exceptional realisations, notably those that included elusive early material from China, the Philippines, Russia, Spanish Colonies and Switzerland. 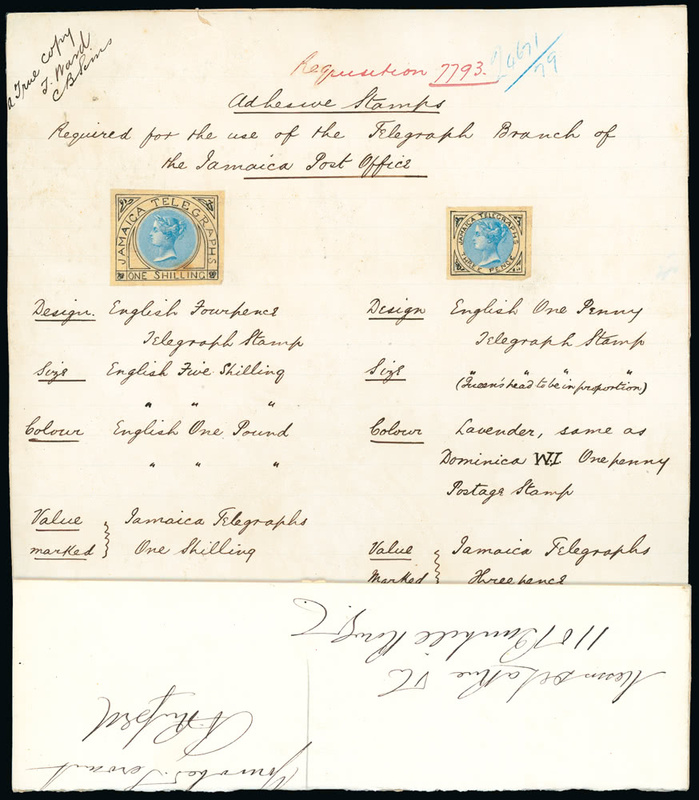 British West Indies included, from the British Virgin Islands, the 1888 envelope to Jersey bearing the 1s. black and rose-carmine on toned paper surcharged 4d. 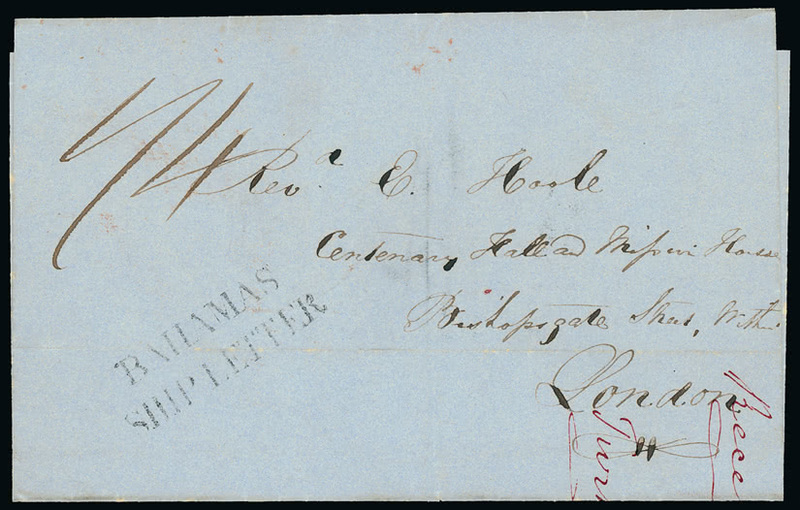 (lot 479, left), believed to be the only known example on cover achieved £6,188. The 1852 stampless entire from Turks Island to London showing the scarce two line “BAHAMAS/SHIP LETTER” handstamp (lot 389) rose to £2,824. Sometimes scarcity can trump condition. 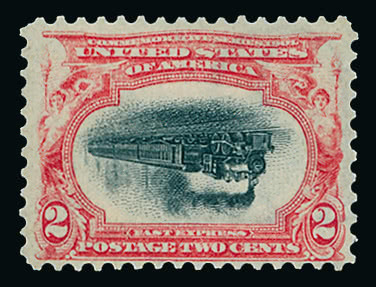 The 2016 Philatelic Foundation certificate accompanying the U.S.A. 1901 Pan-American Exposition 2c. carmine and black centre inverted variety (lot 1247) stated it to be “genuine, unused, reperforated on all four sides and regummed” but nevertheless this rarity easily found a willing buyer for £6,545. This sale will also be remembered as the landmark occasion of the first use of the new live bidding system that allowed clients around the world to both watch the auction and participate in bidding. This unique system will allow those unable to attend to enjoy the auction atmosphere with limited negative effect on the speed of selling – always a popular feature of the Grosvenor auction day.